Sydney, Australia/ Chennai, India – April 28, 2015 – Norske Skog Australasia (NSA), a subsidiary of Norske Skogindustrier ASA (one of the largest producers of publication paper in the world), has successfully gone live with Ramco ERP on Cloud in record time of 8 months. Ramco ERP integrated with Asset Management software (EAM) replaced NSA’s aging legacy system with a single integrated solution. With three mills at Albury NSW, Boyer in Tasmania and Tasman in New Zealand, Norske Skog is the largest publication paper producer in Australasia with an annual production capacity of 715,000 tonnes of newsprint and magazine grades. 650+ users across all three units are today live on Ramco ERP on Cloud. “We were keen to go with a cloud based solution. It fits with our long-term IT strategy and at the same time keeps us on an evergreen platform. With Ramco ERP on Cloud we are able to experience improved processes for workflow and contractor service ordering as well as having real-time visibility on spare parts and materials. With the implementation of a single integrated platform, we will reduce costs and eliminate the complexities of managing multiple systems.” stated Mr. Eric Luck, Vice President Finance, Norske Skog Australasia. It is a clear testament of how Ramco ERP on Cloud as a post-modern and single integrated ERP platform can deliver significant innovation, cost savings, and superior business processes. 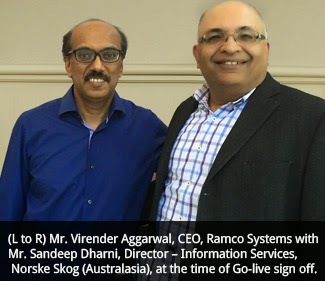 Ramco’s focus on innovations in usability, context-awareness, mobility, overall flexibility, apart from comprehensive set of functionality has enabled smooth transitions possible for customers. Norske Skog is a world leading producer of newsprint and magazine paper, with 9 paper mills around the world. Its business units and sales network confer a unique position with local presence and customer knowledge. The world market for newsprint and magazine paper is about 40 million tonnes, and the group has about 8 per cent and 5 per cent of these segments respectively. The groups operating revenue in 2013 was approximately NOK 13 billion. With three mills at Albury NSW, Boyer in Tasmania and Tasman in New Zealand, Norske Skog Australasia is the largest manufacturer of publication papers in Australasia with an annual production capacity of 715,000 tonnes of Newsprint, Magazine and Light Weight Coated grades.